Sometimes you feel down…that’s normal. It comes with the territory called “being alive”. Life is like a wave; and just like the wave, it has both troughs and crests. There has never been, and there will never be a wave that does not have a top and bottom, an up and a down. Over the years, I’ve learned a number of ways to power my way up and out of the place called “down”. I’ve learned to create and regain Momentum and to motivate myself. 1. Remember that Down Is Temporary. Remember that every coin has two sides and just because you’re experiencing the down side, that does not mean there isn’t an upside too. When your Momentum and motivation are low, decide to invest energy and you will change your situation. Go out for a walk when you say you can’t. Make a call when you say you are too tired…you’ll soon discover that your Mo and go will return. 2. Take One Small Step. Any change can begin with one small step. Often, we keep ourselves stuck in a rut by thinking that in order to feel better, we have to accomplish something huge. Take a small step and repeat with small increments and increases. The benefits will grow and so will your Momentum. If you’re low and want to be more fit, start off by doing a couple of minutes of exercise that day. Repeat this daily for a week. Then, increase it by five minutes a day each week for a month. Soon, you will be doing over 20 minutes of exercise a day. You will feel better, change “down” to “up” and build your Momentum. Here’s a powerful solution: Choose a single project or goal to focus on. Do that one and do it well. You will have time and energy to move on to others when you regain your accomplishment energy and motivation. 4. Ask for Help. When you are feeling low, reach out. We are like batteries…sometimes we can give a charge to ourselves and others, sometimes we need a charge. Get the help of friends and family. Get it from your inner circle or seek it online. Write me…ask me for support. 5. Practice Momentum Thinking. When you are feeling down, you are “thinking down” and it is your Thinking that’s the real cause of your feeling. 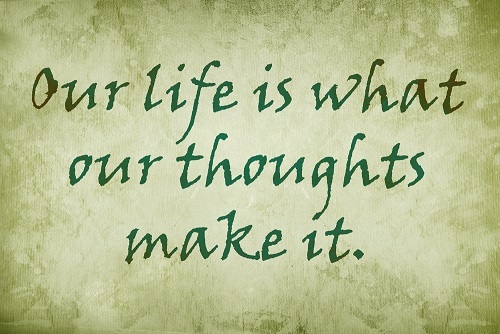 To improve your situation, begin to track your thoughts. Listen to what you are saying to yourself. It’s your negative thoughts that are stopping you and keeping you stuck. Use disputation skills to counter these thoughts and regain your Momentum. Replace “I can’t do it!” with “Just watch!” Change your thoughts and you’ll change your motivation and outcomes. Learn the Momentum Mind method. 6. Remind yourself Daily. Put reminders that are motivational in front of you daily. Subscribe to services like the AmMo morning email to keep your goal and other motivational tools in front of you every day. Send reminders to yourself and post short notes in big bold letters; post pictures of what you will look like or feel like when you reach your goal in all the places that you look at regularly… your mirror, your desk, the refrigerator, your steering wheel. If “Out of Sight is Out of Mind”, then keep your goals “Within Sight, Within Mind”. 7. Broadcast your Goal. Let many people know about your goal in general and let family, friends and colleagues know about it specifically. By doing this, you are committing yourself to moving from a rut into action, from being stuck to making an improvement. Write a commitment contract, give copies to people you want to support you and give them regular updates on your progress. 8. Practice Proportional Thinking. Any time I feel low, I use a skill I taught myself many years ago to cut my “low” down to size. I realized by studying my thinking that when I was feeling crumby, I had the habit of making my problems bigger than they actually were and of telling myself that I was less capable of improving the situation than I actually am. I also realized that this is a very common problem for many people. When I feel particularly down or overwhelmed, I practice diaphragmatic belly breathing and as I relax and calm myself, I say: “I’m going to sleep on this tonight. When I go to bed, I’m going to fully let go and get a full, restful sleep. By the time I awaken tomorrow, I will be more refreshed and be filled with the enthusiasm and Momentum I need to break this cycle.” I then take a shower and invariably in the shower, I turn my thoughts into positivity and simplification and toward problem-solving. Do it yourself and please share your results with me and other readers. 10. Change your Words and Build Momentum. Your words are enormously powerful. To move forward and upward, change the tone and direction of your thinking. Replace your current words. Go from “Problem” to “Opportunity”. Go from “Difficulties” to “Benefits”. Small, consistent changes in your words will change “Pessimism” to “Optimism” and “Inertia” to “Momentum”. re-energizing yourself and regaining your balance and Momentum. Thank you so much for this. I smiled today when I read it. Those are definitely many steps I have learned from you over the years and a reminder at this time of year is always a welcome blessing. Wonderful tools to use. I will print them and keep them very close to my desk, to be looked at and practiced when the need is there. Thank you for this, I have been feeling low for too long now. I need to get my life moving. I want to be happy again. 1. Consider reading the other blog posts.